Technically - there's no expiration date on the vinyl. It's officially rated for 3-4 years of indoor use but I've seen several of ours up for at least that long (thanks, mom!) and they look as brilliant now as the day we installed them. The color is still nice and rich and the adhesive is true. However - there is a bit of an expiration date on the transfer tape. Its adhesive tends to lose its integrity after it's been sitting for awhile (especially in the heat of the summer). And so, well enough to make for easy removal. For that reason, we recommend that you install your new wall quotes within 2-3 weeks of receiving them and honestly, the sooner the better. If, for any reason it's been longer than our recommended time frame, there are a few tricks you can use to make the process go a bit more smoothly. First - be sure to put the lettering/desing facedown (I can't stress how important this is) on a firm surface. Then rub smoothly and firmly all over the with included application tool. Start from the upper right hand corner, and working very slowly and at an angle, pull away the backing paper. Watch very closely to be sure the letters aren't pulling up with the backing paper - if they are, stop. Crease the backing paper in that spot as you press it back towards the transfer tape. This should release the letter so pull up again carefully. If no, take the edge of your fingernail and pick at the edge of the letter. This will release it and you can continue. The trick is to go very very slowly so that you don't pull up and tear a letter. Yes - it's very time-consuming and can be frustrating. (See why we recommend the 2-3 week window?) But it'll be worth it in the end. Emily ordered a fabulous custom quote with us almost a year ago. But she decided to wait to install it thinking that she wanted to change the wall color. She did just that and a couple weeks ago was finally ready to put up her new wall quote (probably because she's 8 months pregnant and nesting!). But she was having trouble; she wrote: "it doesn't seem to want to adhere to the transfer paper even after repeated vigorous rubbings with the included tool. Have I waited too long?" The short answer was yes. I reviewed with her the tips I mentioned above and assured her that if it was still a huge problem, the letters tore or it was just too frustrating (which is sometimes the case), we'd be happy to help with a recut discount. I was delighted to receive her follow-up a week later: "I emailed a few weeks ago asking if there was an 'expiration date' of sorts on the vinyl wall quotes and was a little disappointed to find out that in fact there was. "But I just wanted to share because I figured out a way to get it up there with the minimum amount of frustration. I wound up cutting the large quote into somewhat irregularly shaped pieces, each piece containing one word." "Before I cut it up I hung it on the wall when it was still whole and marked the top and corners with pieces of blue tape so I would have something level to go by." "Then I just started with a piece in the corner and made my way across one row of text and then back across the next row. I pieced them together like a puzzle." Isn't that a genius idea? And I'm so glad she sent photos to document the process. "And yes, I'm 8.5 months pregnant and standing on the kitchen counter but sometimes you've gotta do what you've gotta do and this just had to get done! I couldn't bear to throw it away! Anyway, I hope this helps someone else who might struggle with the same issue. I know it won't work for every design but I feel like regardless of whether or not I was having trouble with the letters sticking it still would have been the easiest way to apply such a large quote." I'm so proud of her (especially considering I'm also 8 months pregnant and this seems like an incredible feat to accomplish at this point). 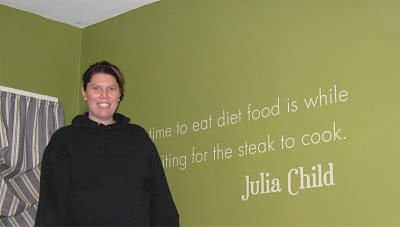 And maybe it'll help you - and at least inspire you to get the quote up on the wall as soon as possible (grin). Of course - if you have questions or trouble or concerns at all, please let us know; we're always happy to help and want to be sure you enjoy your new wall quotes.